It would have been all too easy for the West Australian Symphony Orchestra to get swept away with the sheer size of their Rachmaninov’s Rhapsody concert, held as part of their MACA Limited Classic Series. Under the baton of Spanish conductor Jaime Martín, Tchaikovsky’s symphonic poem The Tempest, Rachmaninov’s showpiece Rhapsody on a Theme of Paganini and Stravinsky’s ballet Petrushka made for an all-Russian offering ranging from sumptuous romanticism to theatrical modernism. In addition, the young Uzbek pianist Behzod Abduraimov, whose 2019 concert commitments have so far seen him tour the US, Germany and South Korea, had made just one stop in Australia for his performance of Rachmaninov’s Rhapsody with WASO. However, despite the demanding repertoire and exciting international guest appearances, control and precision were key to the evening’s performance, with Martín leading a disciplined (but by no means stifled) performance by WASO. From the opening chorale of Tchaikovsky’s The Tempest, Martín’s approach to the orchestra was revealed. Nothing short of pin-point accuracy would suffice, and WASO’s wind section moved beautifully through the chorale as one complete organism. The ceaseless movements of the strings were similarly unified, evoking the restless sea upon which the drama of The Tempest takes place, and one could almost visualise the waves as the sea of bows moved up and down in a tight orchestral choreography. However, Martín gave the orchestra plenty of room to breathe and expand. Dramatic storminess was effortlessly conjured by the force of the brass, strings and piccolo in thrilling splashes of colour, and the obligatory Tchaikovsky ‘love theme’ was heart-warming whilst maintaining the unified tightness of the opening sections. Rachmaninov’s Rhapsody on a Theme of Paganini is the ultimate crowd-pleasing piece; dazzling virtuosity, colourful orchestration and a recognisable ‘famous bit’ sampled by film scores and advertisements. 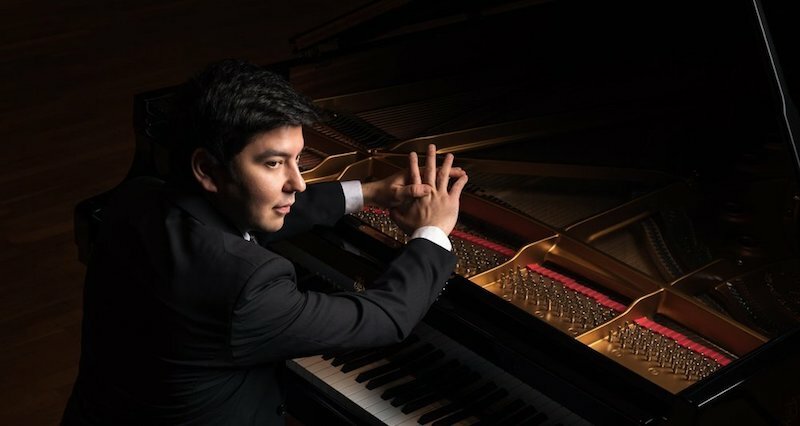 Abduraimov was a marvel to witness at the piano and seemed completely at ease with everything that Rachmaninov threw at him, from the whip-cracking intensity of the quicker variations to the serene, rhapsodic interjections towards the middle of the work. The famed 18th Variation was refreshing in its rather brisk pace and allowed Abduraimov and WASO to work through the material with dignity rather than wallowing in its luxurious Romanticism. The final six variations saw Abduraimov at his finest; brimming with virtuosic flair whilst enjoying the humour in Rachmaninov’s writing and apparently having a great deal of fun. Martín and WASO were fantastic here too; steady and controlled, interacting a great deal with the soloist. However, the sound of the orchestra was a bit too homogenous for the colourful score, and some wind colours were missing from the overall texture in key moments. Nevertheless, the Rhapsody was a rousing crowd pleaser, as was Abduraimov’s charming encore of La Campanella. Stravinsky’s 1911 ballet Petrushka can make for a peculiar listening experience in a concert setting, particularly following the accessibility of Tchaikovsky and Rachmaninov. Alongside the more modern harmonic language, Petrushka is composed in blocks, as sections of full-textured ensemble work are interspersed with sparse, soloistic passages for only a few players in the orchestra. Though not as well received as the works preceding it, Petrushka was performed at an equally high level, with Martín and WASO excelling at the ballet’s complex rhythmic structure, the Russian folk flavours permeating the music, and the demanding solos sprinkled throughout the work. The trumpet solos of Brent Grapes were especially delightful and executed with the sort of accuracy and attention to detail that had been characteristic of the music-making that evening. Put simply, Rachmaninov’s Rhapsody was an extremely rewarding concert-going experience. The programming of all-Russian music worked beautifully to showcase the range of WASO’s musicianship, and Martín’s leadership of the orchestra produced a polished, tight performance. Hough rocks the Rach Pag while Edwards' Earth Spirit Songs soar again.